Emily Chen: I was really keen when I was in high school, to be very honest. When I was in grade 11 and grade 12 in particular I was involved in a lot of different clubs and activities. Whether it was in the school community, greater Oakville community; I was always involved in some project or conference. It was a bit much to be quite honest with you. But I also really love school. I took a lot of the math and science classes and I really enjoyed that. I was really fortunate because my friend group had a lot of similar interests as me as well in terms of the academic and getting involved sense and we were all in it together and it was actually quite fun. EC: Yeah, so I did that. It’s actually not as hard as you think it is. Because for health professionals we all – or at least I had my own optometrist at the time. So I just walked into her office and I just asked her can I observe you, can I shadow you for an hour. That was a really great experience because it made me realize what Field I would be interested in and what I wanted to look more into as well as which ones I didn’t see myself pursuing and I could just cross those ones off. TA: Stop always saying good question. I mean if ,You can if you want to but you don’t have to. EC: [laughs] Okay, can you repeat the question? TA: [laughs] Okay so you’re in grade 11, you know you want to go to medical school. What kind of schools are you looking at and how are you preparing for that path? EC: I think in grade 11, although I was maybe roughly looking at the different medical schools in Ontario and in Canada I think I was more focused on how to get to that point. So focusing more on the undergraduate schools. I knew that for both undergrad and medical school I wanted to stay in Canada preferably Ontario, and so as a result for undergrad programs I only applied to Ontario schools. I was looking into different science programs and the medical sciences program, which is the one I ended up choosing. EC: So I actually did apply to health science at McMaster. Thought I would go, thought I would get in and everything. But I actually got rejected from the health sci program, that was a big, that was a very healthy wake up call for me. Because I had all my eggs in one basket and when I got the rejection letter I realized: “Where am I going to go? What am I going to do?”. So I started researching other schools, and I looked into Western’s medical science program and it really caught my eye. I did a campus tour there and I just fell in love with the campus and the program was so great because all of the modules that you can choose in upper years and a lot of the course that you pick are focused on the human body and the medical sciences, which is what I wanted to take away from an undergraduate science program. EC: Yes, oh my goodness yes, for sure. That thought has been in my head many times. I had a bit of a mid-undergrad crisis I guess you could call it. Because I just woke up one day and I asked myself, “What are you doing. Sure you want to go to medical school but are you sure? If that doesn’t work out what are you going to do?” I think these are questions every undergrad has to ask themself at every single stage of their education. Just to kind of steer yourself on the right path. So What I did, Was I just did a lot of research on what you can do with a BsC degree. I did more emailing, did more cold calls. You know just messaging people, messaging old contacts that you have and just having phone conversations with them is very helpful. Looking into different grad programs, I was looking at Master’s programs in healthcare, in quality improvement and even in Ivey[business school]. I was considering pursuing a business degree as well. EC: I was also interested in business in high school. Had I not chosen business in high school, I definitely would have chosen a commerce degree. I just liked it because the business world seemed so exciting. Since I had those 2 interests and I had a bachelor of science already under my wing. I thought that combining business and sciences would have been a really, really great and exciting career path. 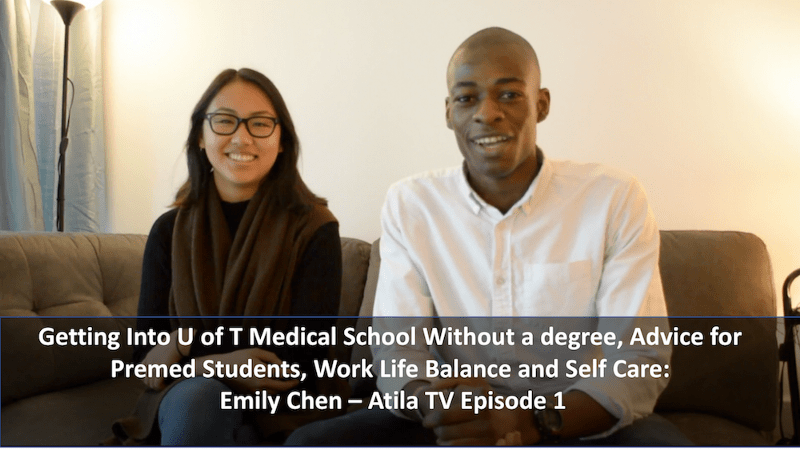 TA: One thing viewers may not know is that you actually did not need to get your undergrad degree before you went to U of T. Why did you feel the need to get your undergrad degree? EC: So I got into U of T [medical school] after my third year. At that point I didn’t finish my four year bachelor of med sci degree. But I thought about it and decided to take summer courses to finish up a three year major as a bachelor of science. I just wanted to do that because I knew that I spent so many years at Western, I loved what I was studying and I spent so much time at effort walking towards that degree I just didn’t want to leave it at that. So for me I guess it was a little bit of closure. But also, I think that there are many perks to finishing your degree and having a degree and having that under your name. Just as an example, for medical school at least, you have the option of completing a masters in tandem with your medical school education. And in order to get opportunities like that you need to get a bachelor’s degree already. I think it opens up more doors for you. TA: You said something off camera about “Who am I? Let’s say I’m in medical school and for whatever reason I’m not able to get through. Undergrad is kind of an insurance policy”. Can you talk a bit more about what you were saying. EC: I wouldn’t say it’s an insurance policy. I think it’s important that right now I don’t have my MD, I am an MD candidate, I am working towards that. But all of that aside, who am I, what do I have. I have a bachelors of science and I’m very, very proud to say that. I had a great few years at Western and I learned so much and I think that having that bachelors of science kind of solidified that. EC: I think the jump from any level of education, whether it’s from high school to undergrad, undergrad to medical school, there’s always going to be learning curves. Every different level of education has different demands from you as a person as well as the curriculum demands. I think the biggest lessons I learned was that of self care and a lot about work life balance. In high school, I was stressed out about the work I had at hand. Then in undergrad I realized that wow high school is such child’s play, now this is the real deal, now I am still stressed out. Even in medical school, sometimes I feel like I’m just a big ball of stress to be honest. One of the biggest learning curves was that of time management and self care. It’s always important, no matter how busy you are, it’s always important to put some time in there for yourself, to discover who you are as a person. Even though you are a student, even though you will be a doctor one day, you’re always going to be a person as well. Its important to hold on to that, to discover who you are, your personality, what you love and don’t love. What your hobbies. Its really important to hold on to that. I think that giving yourself those self care days and being able to hit the reset button really helped motivate me even more. EC: That’s a great question. I think growing up, to be completely candid with you, I think I did get a lot of pressure from my parents. But as a result over time, I think I kind of took that and I started to put pressure on myself. Because I wanted to make them proud and I wanted to make them happy because they sacrificed so much for me and I really do appreciate that and I wanted to show them that. But that’s not what drove me to pursue a career in medicine. I chose that because I genuinely wanted to do that from the bottom of my own hearts and not because my parent told me to. I know that medical school is a very long journey. I am only nine weeks in as a first year student and I know that there is so much more ahead. I think that if I was told to go into med school by my parents, that wouldn’t be incentive enough for me personally to pursue this. EC: Okay we all face those days. Regardless of where we are in life and what field we’re in I think everybody faces that. Burnout I guess you would call it. What helps me, personally what helps me is hitting the reset button and taking those self care days. To take care for yourself and reflect on why you got here in the first place. Why you chose to come to where you are presently. And sometimes it helps if you just think about all that enthusiasm that you had in undergrad and high school. Even reading my medical school application is really motivating for me to get out of bed and go to the library and make my past self proud. I think reflecting on the past and why you’re here, that’s is one thing. As well as looking at at what’s ahead and what the future could hold for you and what the future will hold for you. I find that talking to those who are more experienced, whether they’re upper years or people who are currently practicing medicine, so doctors in the field is really really motivating for me. Because when they tell me about the perks of their job and how much they love their job, or the cool types of techniques that they’re doing, it makes me want to focus and get through this test and be the best that I can be now so I can get to that stage in the future. Where do You See Yourself in 5-25 Years? EC: Wow, good question. Let’s see where I am in the present first. So I am in my tenth week of my first year of medical school. Even though we’ve had this ten week period to transition into the swing of things. I feel like I’m still not fully integrated into the demands of medical school. I still procrastinate like crazy which is awful that’s something that I did in high school, and undergrad and told myself I would stop. But, here I am still doing that. So hopefully, second year medical school I can tame that habit a little more. Be more integrated into the curriculum so I can make the most of my learning, have a good system set in place for myself and be more disciplined. But at the same time I hope I can still hold on to my work and play balance. I’m pretty happy with that for now. Hopefully, I can improve in my clinical skills as well. Hopefully I can learn to use my stethoscope by that point, that’s something I can’t wait to do. So that would be one year from now. Hopefully I can still be involved in the community. You said five years from now. So five years from now I would be in my residency program. At that point I hope I can hold on to all the enthusiasm that I had as a first year med student and all the energy that I had as an undergrad. And make the most of my learning in the clinical environment to make myself the best doctor I can be. Hopefully, have a good sleep routine at that point. I heard residents get very little sleep and drink a lot of coffee so I guess I’ll be doing that. Hopefully I can still make time for myself, to keep myself grounded as not just a resident but also a person. TA: Let’s sneak forward a bit and Say 10 years from now. You’ve finished medical school and you’ve finished your residency, you’re now a doctor. Doctor Emily Chen, Doctor Chen. What kind of doctor would you like to be? What would you like to specialize in and things like that? EC: Sure that’s a good question as well. So I’m still exploring different options. What I love about my U of T curriculum and I’m sure other med schools do this to; is that they give you so much exposure to explore different specialties. But if you could ask me now what I want to do I would say family medicine. Because I love how its like the front line practice of medicine and I like how it focuses a lot on and can focus a lot on preventative care. I love to build a relationship with a family or just people I guess and follow them through their different stages of life and influence their habits along the way. I think that is really important and I would love to do that. At that point, hopefully I can still stay grounded. Hopefully, work won’t be completely my life but I will take it seriously because I guess those would be the first years after I graduate so I have to put the hours to make the payoff bigger in the future. So I guess 25 years from now. Wow, I will be pretty old by that point. Hopefully, have an established practice. Hopefully, know what I’m doing at that point. Be very engaged with my practice and with my work but also find time for myself and my family. I hope that at that point I won’t just be focused on my clinic or just be focused on my practical skills as a doctor. That I can also integrate my own passions in that practise as well and weekly routine. Weather thats finding a good cause that I’m interested in or volunteering some time as a doctor I think that would be really cool. EC: Okay, first for people who are considering going into medicine. [thinks] I think it’s very important to establish why you want to go into medical school for one and most importantly why you want to be a doctor. So in order to do that I think a lot of self-reflection is very important. Figuring out who you are why you want to do this as well as gaining some exposure in the field. Ether it’s in the hospital or the clinic or whatever. Because really if you commit yourself to this, this is going to be the rest of your life. You have to be very passionate, you have to have a love for learning and a love for what you love for the career to avoid burnout and to keep that motivation. I would also say do some research because applying to medical school, in Ontario, in Canada in the States, wherever can be very competitive. So it’s important that you fulfill all the requirements that you have as well as maintaining your own integrity in who you are as a person. As for people who just want to be good people and help others. I would say find your passions and just run with them. I would say try to get involved with some leadership roles if you can. Say you find an organization or a volunteer opportunity that you’re very interested in, stay there as a volunteer for a little bit and then try to move up in leadership positions as you can, to make the biggest impact that you as a student or you as a person can do. TA: Emily, thank you for your time.